Choosing what brakes, rotors, pads, and fluid can be a bit religious at times, especially without a data sheet. Selection isn’t that great either on the performance side either with few options. So I thought I’d share the parts and performance of those parts here. I’ll add more information as it becomes available. 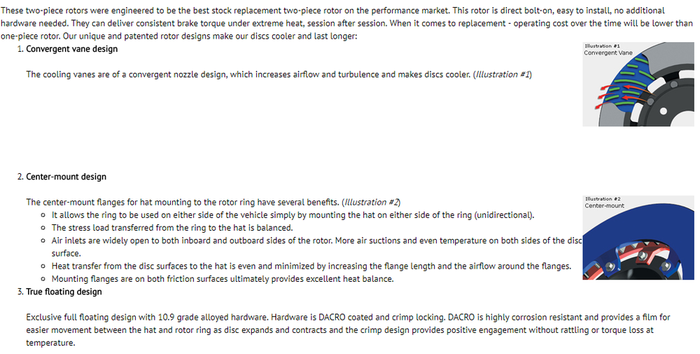 To start, I had the goal of upgrading from the stock very capable rotors to two-piece sets so I could minimize heat transference and more cheaply swap out rotor bodies separate of the hats. 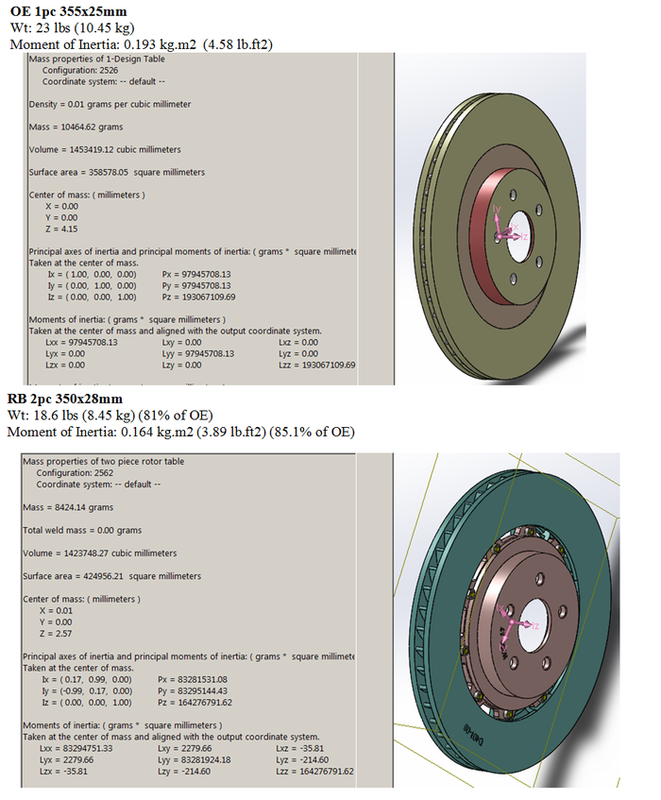 I also wanted to go with slotted rotors to ensure better brake feel under track conditions. Some of these pros/cons are talked about at length here. Change fluids less often, put good fluids in, and reduce waste and time investment. SRF is good stuff, with all the heat the brakes can create, I wanted a good fluid to keep up. No data sheet here, these are 100% for looks, and making me feel like a responsible car owner. Keeping Stock Brembo Calipers, they work just fine. I decided to go with two piece rotors to make replacement and maintenance down the road easier with a hat and body build. The weight reduction is also very welcome, and is noticeable. I went with RB because of the front and rear two piece kit. They feature a slotted design with minor holes in the slots to help ventilation when under hard braking. 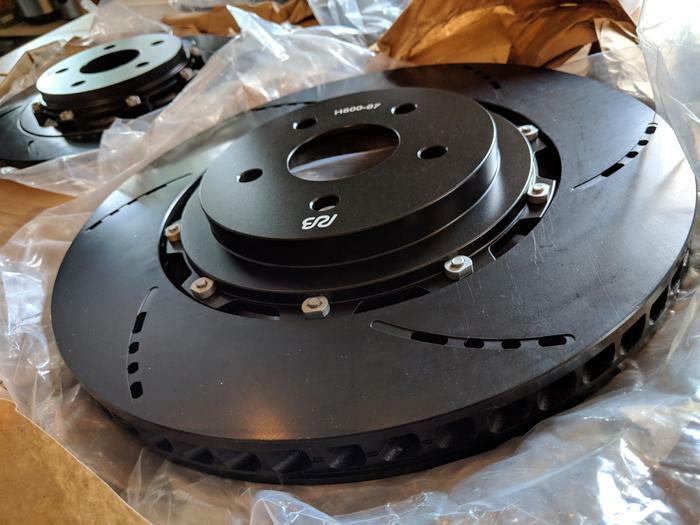 I’ve noticed that the brakes on OEM can fade pretty fast on a technical course, so this is a huge improvement to ensure no brake pad gassing is an issue, or that the heat isn’t being controlled. For pads I am using OEM for now for road use, and swapping for track use. OEM pads work perfectly fine, though they emit a massive amount of brake dust. The WINMAX pads are much less dusty, but a bit louder.